1. Stick with neutral colors on high end pieces (sofa, rug, etc.). Neutral does not mean boring! Bring in patterns with your rug. It will ground your space. 2. 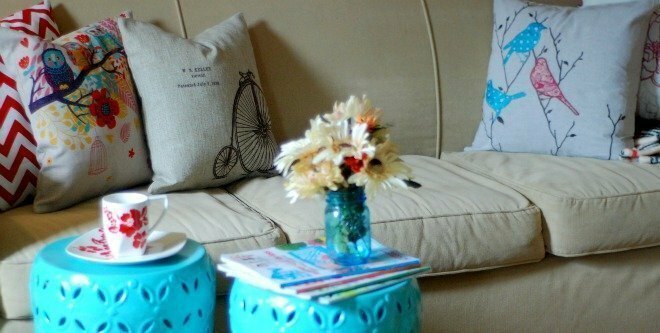 Add pops of color with accent pieces like pillows, etc. When most of your color comes from accent pieces, it’s easier to change things up with the seasons or when you get bored. I normally use the rule of three – have at least three pops of the same color family. But I always remember that rules are sometimes meant to be broken when it comes to decorating. One way to bring in color is to introduce it on your walls. It’s a heck of a lot cheaper to repaint walls than to buy a new sofa. Helpful Hint: As you know, new throw pillows can be expensive! I buy pillow covers instead. I have found them on Amazon for as little as $9.00! And they have some really cute ones that have a zipper so that you can insert your own pillow. You can click on my Amazon ad to the right of this post and I’ll get a tiny little commission if you order from my site. 3. Shop with style and function in mind. Choose a lamp that is beautiful when switched on or off. 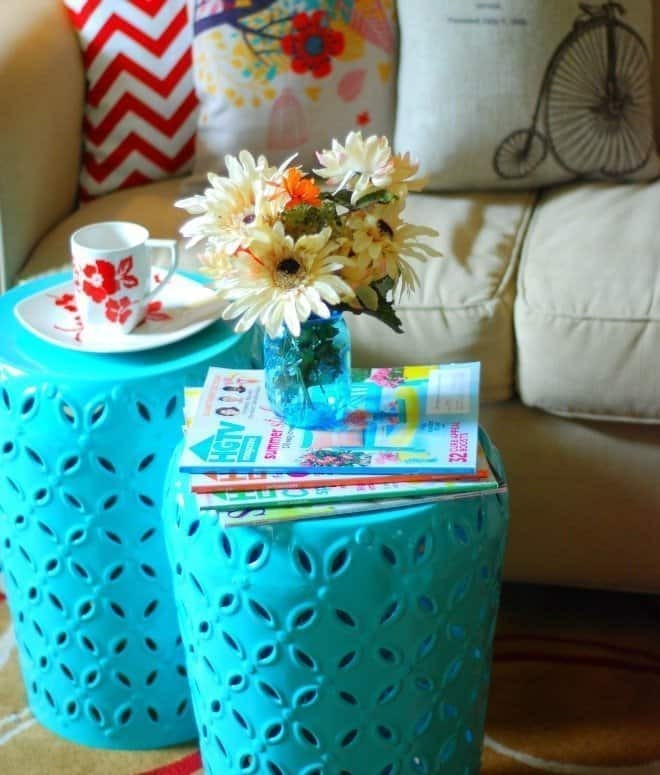 And who says you have to use an actual coffee table? I love my garden stools! I use them as a place to park my coffee, books, magazines, etc. and they also work for extra seating. And you can use them indoors and outside. 4. Choose furniture that is timeless. I don’t know about you, but my style has changed several times over the years. My sofas are timeless and will look good for years to come. 5. Leave the matchy matchy sets on the storeroom floor. When every piece of furniture has the same texture, color, look, etc., it screams boring! 6. Measure your space before buying large pieces. That’s why I keep a measuring tape in my purse. Measure your space and you also need to measure the pieces in the show room or pay attention to the measurements if ordering online. Furniture looks much smaller in the large showroom than it will in your living space. Helpful Hint: Use painter’s tape and tape off the area where your new piece of furniture will go. Measure it and you’re all set! Make sure you use some circular pieces to break up all the squares and rectangles. Helpful Hint: My favorite rooms are those that look like they have been put together over time. Everything goes together, but it doesn’t all match. 8. 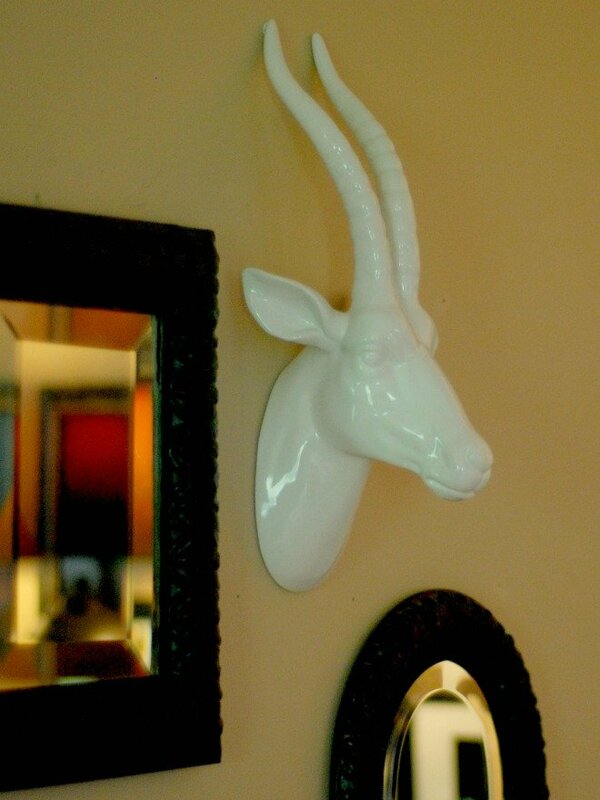 If using a mirror as wall art, make sure it’s positioned to bring in light and to reflect something beautiful. You can find my tips for hanging artwork here! 9. Can’t seem to get inspired? Grab inspiration from a painting, a magazine or the paint store. My entire living room was designed around my wool rug that was a steal! I broke my own rule and purchased a rug that was neutral, but with a pop of red. Red is my favorite color and goes with so many other colors, and I couldn’t resist the price! 10. Above all, own your space. Make sure it’s a reflection of you. Go check out your closet. Yes, your closet. The colors that you tend to wear will work perfectly in your home! Buy a copy of HGTV magazine and browse through it. Mark all the pages that speak to you and before long you will come up with the perfect color scheme for your living room! Got any great decorating tips you’d like to share? 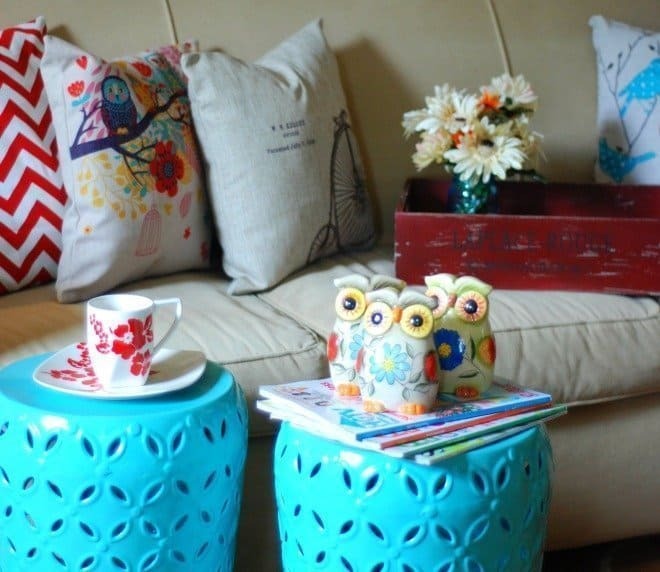 I just love the owl pillow and little owl decorative pieces. So darling! What a beautiful home!! I’m so excited – I do most of these things already without knowing they were good to do LOL (I don’t really have a rhyme or reason for my decor…I just play with it until my “eye” likes it. However, we ARE on the hunt for a new sofa, so I will make sure I measure! You are so creative, Kristen, I figured you know all the tricks and tips already! 🙂 I’m sure you could show me a few. 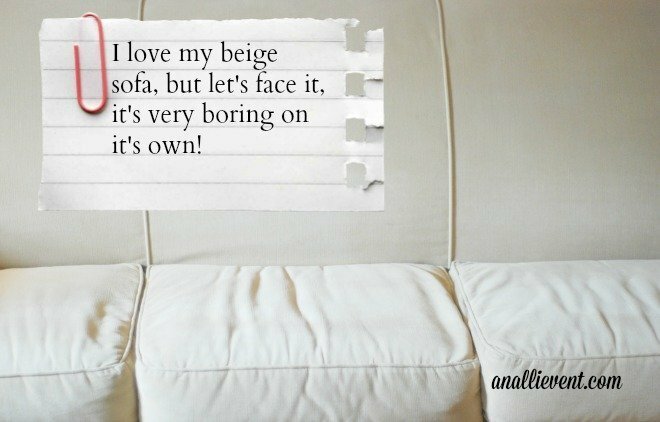 As for as sofa’s go, I don’t like loose back cushions – they tend to never look right and my husband must have a high back. Very good tips Alli! My whole house needs some decor work. I just throw anything together and just call it a day. These are great ideas! We are currently looking for a rug. I need to remember to look for neutrals. When I was looking for my dining room rug – I needed a really large one – I went to one of those rug outlets that advertises on TV about how great their sales are and was very disappointed. Overstock.com and Home Decorators has much better deals, especially when I click on the clearance or outlet tab. I love these end tables! Are they repurposed or did you buy them that way? Great, easy ideas! Thanks for the inspiration! Great tips!! It’s funny I had a neutral off white sofa for 7 years so for my new sofa I went with color and bought a red one! Or as I was told “paprika”. I still have the other one in the same room and used accent pillows to bring the two together! I love walking through furniture stores for my inspiration! You have inspired me to make my living room my own! Thanks for the great tips! Your pictures are absolutely gorgeous! I’m trying to decorate my living right now and am at a total road block – we have a couch that I adore but everything else is just so boring – I def think I’m going to invest in some new throw pillows to brighten up the area. 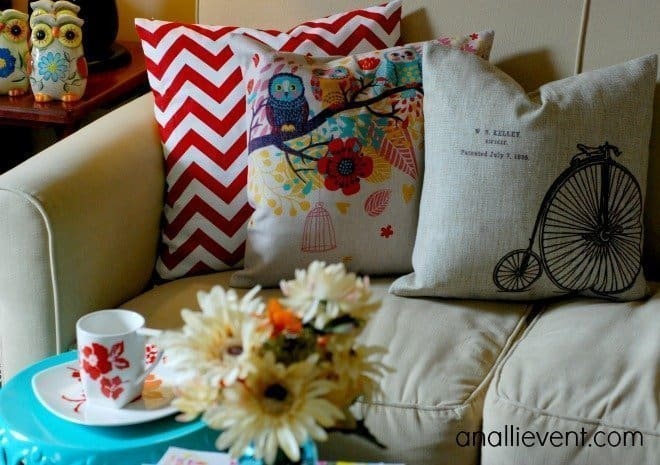 Pillows are great to add pops of color and I really like pillow covers so that I change them up without spending a lot of money. Beautiful! 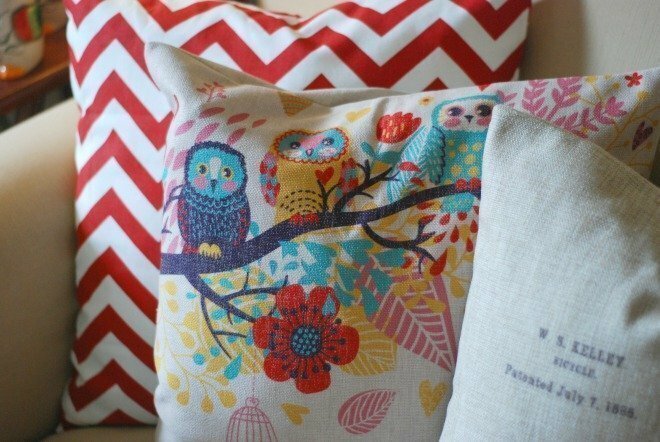 Love the owls, and the birds and owls pillow case. Good tips, thank you! Alli, you always seem to have such beautiful colors in your home. I guess the teenager was right after all! I love the idea of adding color/patterns to balance the neutral! Neutral definitely does not mean boring. I love neutral pieces with pops of pattern and color. Its amazing how you can create a room to pop with color! That blue is my favorite color! I have it around in my home! Oooh love those colors, Alli! That teenager was right. Red is my favorite color also. I am all about REPURPOSE. Why go out and buy something when you have a piece already? Thank God for Pinterest and posts like yours. Pinning! My husband and I have been thinking about purchasing new living room furniture for our home. I’m glad that you mentioned measuring both the space and the furniture before we purchase it. We do want a couch, and that can be difficult because of its large size. Hopefully we can find the right furniture for the living room. Thanks for the tip! Thanks! Yes, it’s so important to measure before buying – saves a lot of heartaches. Look into brand names, but don’t be too biased. Sometimes brand names are better, but that doesn’t mean you should overlook cheaper non-brand makes. A well-known name does not imply quality, though often times there is good reason for such a reputation. The important thing is to test mattresses in person and figure out what feels best for your own body.